Eating a variety of whole plant-based foods is essential for healing and maintaining excellent health. Science is now discovering that some foods, when eaten together, increase the effects of their individual nutrients, providing even greater health benefits. This is called food synergy. Last month I wrote about lemons. Today, it’s all about tomatoes. It’s well known that tomatoes are an excellent source of antioxidants: beta-carotene, vitamin E, and vitamin C. But did you know that they are also rich in potassium and a very good source of copper, manganese, dietary fiber, vitamin B6, folate, niacin, and phosphorus? And have you heard that tomato peels contain all four major carotenoids that help protect your body from cancer? When tomatoes are cooked, the lycopene (one of the major carotenoids that lowers the risk of cardiovascular disease and certain cancers) becomes even more bioavailable, increasing the amount your body can absorb. What’s even more amazing is that when tomatoes are combined with cruciferous vegetables, avocados or olive oil, a synergistic effect occurs that enables your body to more easily absorb and use those powerful anti-cancer and healing nutrients. Tomatoes and Cruciferous Vegetables – Individually, tomatoes and cruciferous vegetables (broccoli, cauliflower, cabbage, etc.) contain cancer-fighting properties, each food providing distinctive bioactive compounds that fight cancer in different ways. Research has discovered that, when tomatoes and cruciferous vegetables are combined, cancer fighting properties of each are significantly enhanced as the carotenoids in tomatoes increase the bioactive components found in the vegetables. One study at the University of Illinois focused on the synergistic effect of broccoli and tomatoes. They discovered that the tumor-inhibiting effects are significantly enhanced when broccoli and tomatoes are eaten together. It has also been found that chopping and then heating the vegetables makes the cancer fighting compounds even more active. The cutting process breaks the cells and activates an enzyme that initiates a cellular process that results in increased cancer protection. And, as I mentioned in last month’s Lemon Synergy blog, adding a little lemon juice to broccoli increases that enzyme activity. However, be careful of overcooking cruciferous veggies as it results in decreasing their nutrient power. It’s best to steam or sauté lightly. 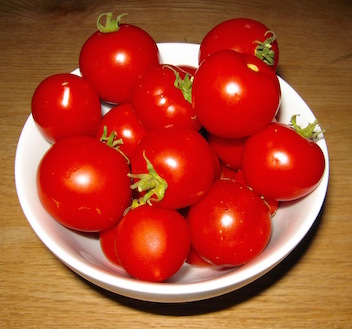 Tomatoes and Avocados or Olive Oil – Science has proven that lycopene is fat soluble. As a result, consuming healthy fats with tomatoes increases your body’s absorption rate of the lycopene. According to a study from Ohio State University, when tomatoes are eaten along with avocados or olive oil, the body’s absorption of lycopene is increased up to 15 times. In addition, in 2000, a study in Free Radical Biology and Medicine revealed that, when people consumed tomato products with extra-virgin olive oil versus sunflower oil, researchers discovered that olive oil raised the antioxidant activity of the lycopene in tomatoes. However, consuming sunflower oil produced no effect. Roast or sauté tomatoes with onion and red bell pepper and a little olive oil, garlic, Italian herbs and sea salt. Once cooked, blend in a food processor or blender until the desired consistency then serve over pasta or your favorite grain. Ta da! You’ve got a delicious, high powered nutritious sauce to go with your meal. Next time you go grocery shopping, don’t forget your tomatoes. This entry was posted in cancer, Healing, Nutrition, Organic, Plant-based, plant-based, Recipes, Vegan, WFPB, Whole food, Whole food, plant-based and tagged cancer fighting foods, fighting disease with food, healthy choices, how to eat healthy. Bookmark the permalink.